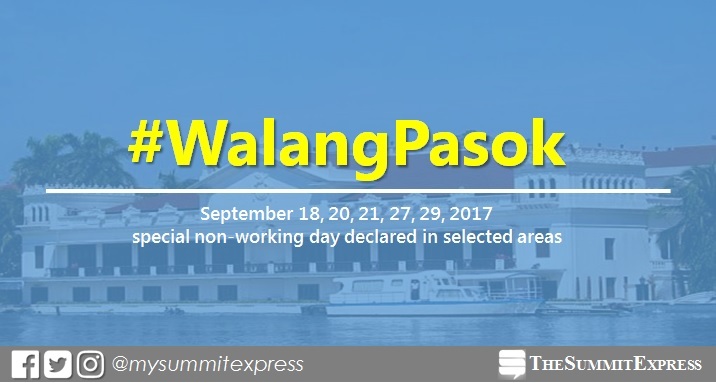 MANILA, Philippines - (UPDATED) There will be no classes and work in selected areas for the specific dates of September 2017 (18, 20, 21, 27, 29) to give way for the celebration of local events, Malacañang Palace declared. Proclamation numbers 295, 301, 305-309 declare special non-working day in the following areas: Bansalan, Davao del Sur; Dingras, Ilocos Norte; Tacurong, Sultan Kudarat; San Rafael, Bulacan; San Mateo, Rizal; Malvar, Batangas and Lobo, Batangas. RELATED STORY: Malacanang Palace issued Memorandum Circular (MC) No. 26 to suspend work in government offices and classes in public schools (nationwide) on Thursday in view of the observance of the "National Day of Protest," based on Proclamation No. 319. As per the Office of the Executive Secretary, MC No. 26 will only cover the executive branch of government, including LGUs, and public schools at all levels, including state and LGU universities and colleges and technical and vocational schools. In the case of the public sector, "the suspension of work in private companies and classes in private schools in the affected areas is left to the sound discretion of their respective heads," the MC stated. Proclamation No. 295: Celebration of 65th Foundation Day of the Municipality of Bansalan, Davao del Sur on Monday, September 18. Proclamation No. 301: Commemoration of birth anniversary of Josefa LLanes Escoda, Worl War II heroine and the founder of Girl Scouts of the Philippines, on September 20 (Wednesday) in the Municipality of of Dingras, Ilocos Norte. Proclamation No. 305: Celebration of 17th Cityhood anniversary and the Takakudong Festival 2017 in the City of Tacurong on Monday, September 18. Proclamation No. 306: Celebration of the 267th Foundation Day of the Municipality of San Rafael, Bulacan on Friday, September 29. Proclamation No. 307: Celebration of the 446th Foundation Day of the Municipality of San Mateo, Rizal on Thursday, September 21. Proclamation No. 308: Commemoration of the 152nd birth anniversary of General Miguel Malvar on Wednesday, September 27 in the municipality of Malvar, Batangas. Proclamation No. 309: Celebration of 146th Founding Anniversary in the Municipality of Lobo, Batangas on Wednesday, September 27.